I really love the lens. The bokeh is very good and sharpness is good at f/1.2 if you get the focusing right (which ain't easy). From f/2 my copy is very sharp all the way into the APS corners. It is a way better lens than the AF 50mm/1.7, which I like a lot too. if that last one really is wide open, thats a remarkably 100% crop IMHO. I never believes it was that good wide open. Unless you have a very good sample or something . Thanks for sharing it & well done. I'm myself not 100% sure if that last one was really at f/1.2. At least I can't find any traces of the eight sided aperture in the OOF area. Possibly the lens was set between f/1.2 and f/2 for this shot. There's no click stop but it's still possible to set it there. Here's a 100% crop of the other f/1.2 shown above, and IMO it's not bad either although maybe not quite as good as the other one. I did my conversion in the same way couple of months ago. Recently after reading Shao's post conversion with rom chip, I order a M42 adapater with rom chip from JamesLaoT and replace the adapter and it work perfectly with focus confirmation and exif info. The only drawback is James adapter measures 64mm in diameter and I have to have my brother-in-law, he's a mechanic, to trim it down to 62mm in order to fit the lens barrel. The other way to work around is just to order a rom chip with data 58/1.2 from James and glue the chip to the adapter like Shao. But I figure this would be harder for me. Just to share my experience and joy of having a f1.2 lens. 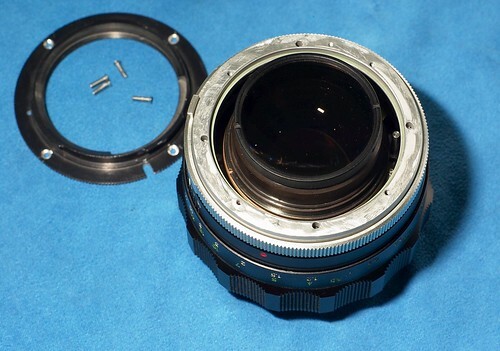 When I did my conversion (first non-electric, later added a chip from Lao to another M42 adapter), I sanded down the ring on the lens instead of the adapter. It doesn't require much skill or finesse, as it is just the outer rim which needs to go. This makes the modification somewhat less reversible, but that is not an issue for me. I don't have the means to turn stuff from metal and plastic was the easiest thing to cut I had at home. Also I had a sheet of plastic which was exactly 1 mm thick, so two of them gave exactly the thickness which I needed for the conversion. I also wanted to do the conversion fully reversible to maintain the resale value just in case. I also wanted to do the conversion fully reversible to maintain the resale value just in case. Just how much do these 58/1.2 (with the rubber focus) go for exactly? Value of the w/o the conversion I mean obviously. They are hard to come by here. Of course it's great that you got it working with plastic, I personally just find the suggested aluminium/baking foil a lot easier to cut with regular scissors than plastic, and the thickness is way more adjustable. And it's equally reversible. But, nothing wrong with the plastic solution if it suits you and you can live with the way it looks, you'll have a great lens regardless of what's inside the mount! I had one of mine converted by means of an aluminum spacer and a genuine Minolta 50/1.7AF mount flange part I'd bought from Minolta in NJ for $15. That would also be one GIANT lens ! I'm sure we will see a 1.2 lens of some sort arrive one day, just god knows when. Amen brother. What an awesome idea! I got mine in good condition for just over 100 €, which is rather cheap I think. Typically they go for around 150 to 200 € as far as I know. Probably the lens is worth even more in the converted state. Shaocaholica sold a converted 58/1.2 with rom chip on ebay and it went for 723 USD. Still I wanted to keep the conversion reversible. My father has an old x-700 on which I might want to use the lens some day. Thanks for the info :). Yeah, id seen Shaocaholica's sale on ebay. Just never sure of what price the SR mount original goes for... its hard to tell when they pop up once every never here in the UK . Can i ask if you have had any problems with flare/what hood you use? This page was generated in 0.076 seconds.